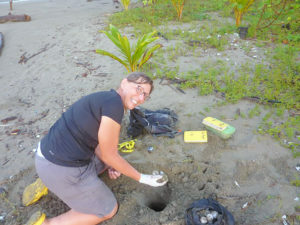 A MELKSHAM resident has returned from a month long trip in Costa Rica, volunteering for a turtle conservation project. Former mayor of Melksham, Davina Griffin, travelled to Playa San Miguel on the Nicoya Peninsula of Costa Rica to help the conservation charity, Turtle Trax, with work to protect olive ridley sea turtles – a vulnerable species of turtle. Work involved locating turtle eggs buried in the sand and moving them to a safe location to protect them from poachers and predators. “We were moving the eggs to try and increase the chances of more turtles reaching adulthood,” Davina explained to Melksham News. “Of the hatchlings that hatch and go back to the sea, only one in a 1,000 makes it to adulthood to reproduce – they are not sexually mature until they are 25 years old. Other work involved clearing driftwood from the beach to help improve access to and from the beach for the turtles and clearing the beach of plastic waste. Davina said, “Plastic – there was loads and loads of it – mostly little tiny pieces which could easily be eaten by all manner of living creatures. About the inspiration behind her trip, Davina explained, “I retired nearly a year ago and I read a book called ‘Quiet’ by Susan Cain. She had three questions to help you decide what you wanted to do in the future – one was, ‘who do you envy?’, and I realised that not for what they do, but what they see, I envy wildlife photographers and presenters. “So I set myself the goal of seeing more wildlife – I am awestruck by seeing things. When I first saw the turtles come out of the ground I was overwhelmed with wonder! Summing up her experience in Costa Rica, Davina said, “It was fab, absolutely fab, having the privilege of seeing turtles in such close proximity – wildlife that has survived for at least 25 years to become sexually mature, laying eggs in front of you – it’s such a privilege.